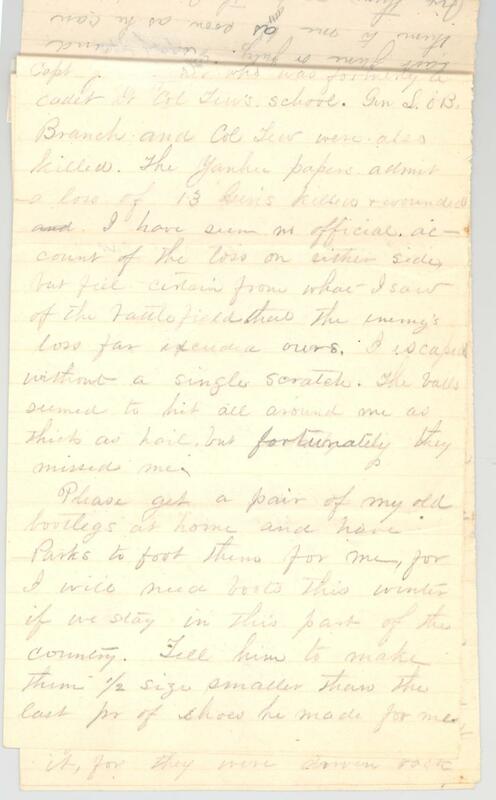 Item description: Letter, 29 September 1862, from James A. Graham, third lieutenant in the “Orange Guard,” Company G, 27th Regiment N.C. Troops, to his father William A. Graham. Item citation: From the James Augustus Graham Papers, #283, Southern Historical Collection, The Wilson Library, University of North Carolina at Chapel Hill. 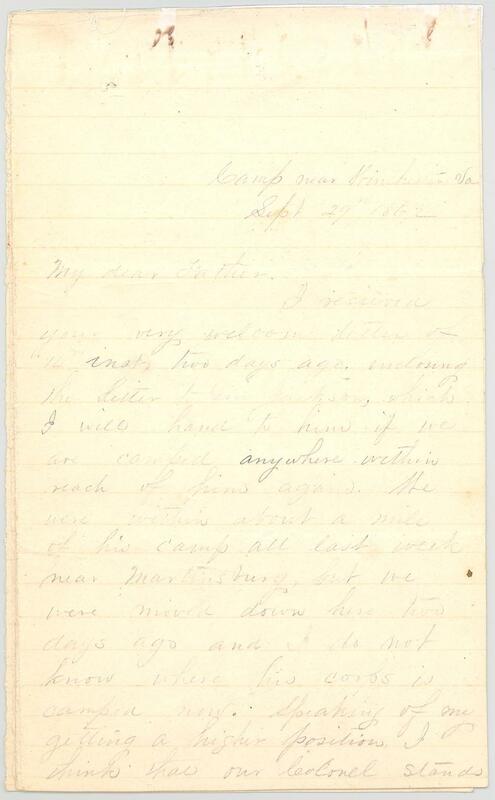 I received your very welcome letter of 14th inst, two days ago enclosing the letter to Gen. Jackson, which I will hand to him if we are camped anywhere within reach of him again. 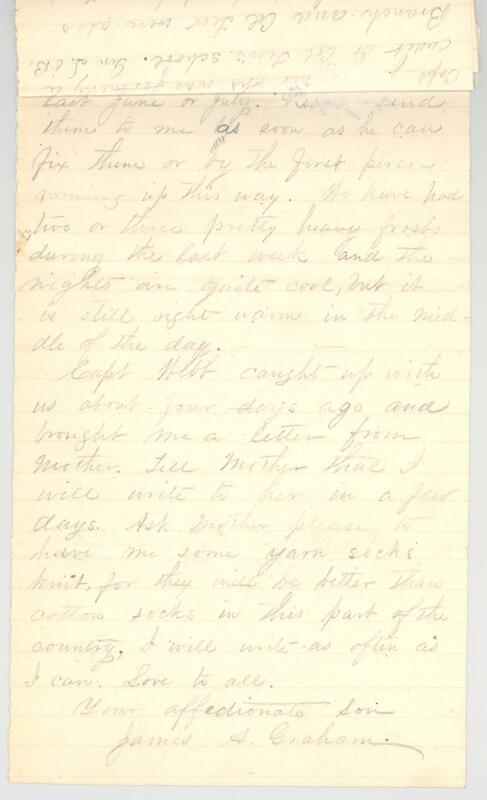 We were within about a mile of his camp all last week near Martinsburg, but we were moved down here two days ago and I do not know where his corps is camped now. Speaking of my getting a higher position I think that our Colonel stands a very good chance for promotion to a Brig. Gen’ship, as there are several vacancies now, and I feel pretty certain that I will be on his staff if he is promoted. Our Reg’t has been on the march ever since we left Rapidan (Sept 1st) with the exception of four or five days last week when we were camped near Martinsburg Va. We went from Rapidan via Culpepper C.H. Warrenton Manassas & Leesburg to Frederick City, Md. then recrossing the Potomac we came to Haper’s Ferry and were there when it surrendered. We left there the day after its capture and crossing the Potomac again at Shepherdstown proceeded to Sharpsburg Md and were engaged in the battle there on the 17th. Our Reg’t went into the fight with 299 men and 26 officers, were engaged for 7 hours and lost 87 men & 16 officers killed & wounded. Our men behaved very well and we were very highly complimented by every Gen. on the field. Our Col. (Cooke) commanded our Right and the 3d. Ark. 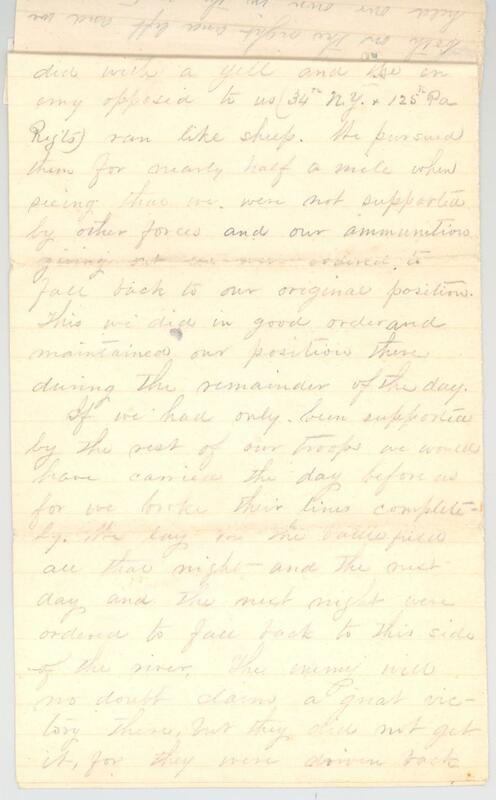 Reg’t and Gen. Lee said that a charge that our two Reg’ts made changed the fortunes of the day. 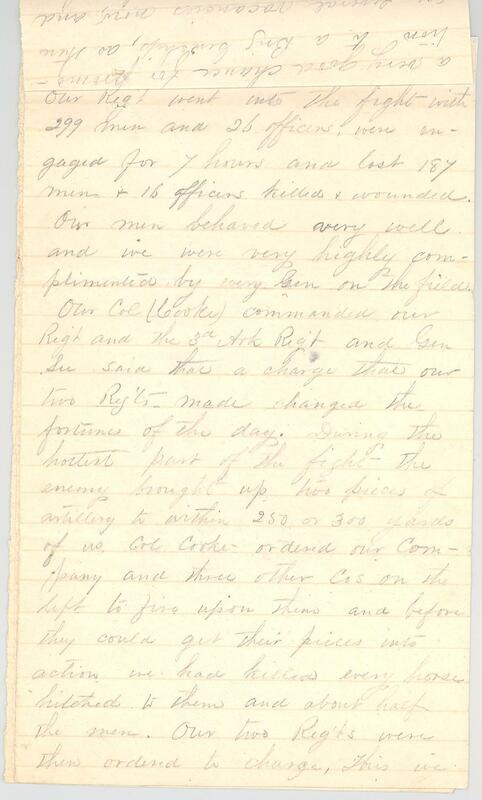 During the hottest part of the fight the enemy brought up two pieces of artillery to within 250 or 300 yards of us, Col. Cooke ordered our Company and three other Cos on the left to fire upon them and before they could get their pieces into action we had killed every horse hitched to them and about half the men. Our two Reg’ts were then ordered to charge. This we did with a yell and the enemy opposed to us (34th N.Y. & 125th Pa Reg’ts) ran like sheep. We pursued them for nearly half a mile when seeing that we were not supported by other forces and our ammunition giving out we were ordered to fall back to our original position. This we did in good order and maintaining our position there during the remainder of the day. If we had only been supported by the rest of our troops we would have carried the day before us for we broke their lines completely. We lay on the battlefield all that night and the next day and the next night were ordered to fall back to this side of the river. The enemy no doubt will claim a great victory there, but they did not get it, for they were driven back both on the right and left and we held our own in the centre or rather drove them back a little. Lt. Jas. 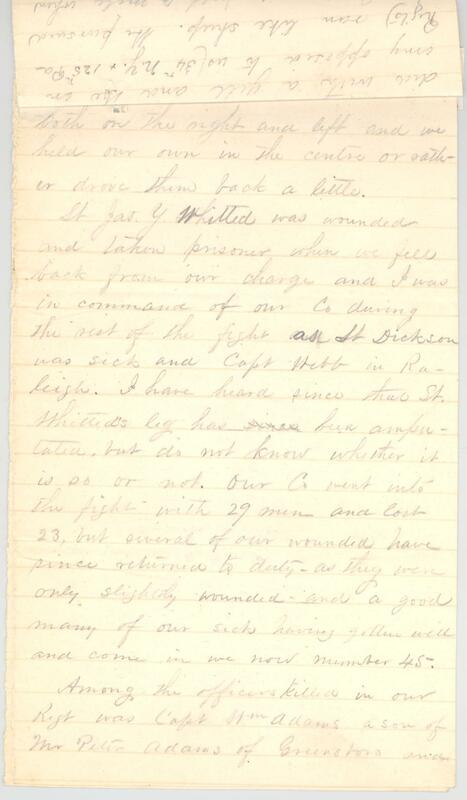 Y. Whitted was wounded and taken prisoner when we fell back from our charge and I was in command of our Co. during the rest of the fight as Lt. Dickson was sick and Capt. Webb in Raleigh. I have heard since that Lt. Whitted’s leg has been amputated, but do not know whether it is so or not. Our Co went into the fight with 29 men and lost 23, but several of our wounded have since returned to duty — as they were only slightly wounded and a good many of our sick having gotten welt and come in we now number 45. Among the officers killed in our Regt was Capt. Wm Adams a son of Mr Peter Adams of Greensboro. Gen. L. O’B Branch and Col. Tew were also killed. The Yankee papers admit a loss of 13 Gens. killed & wounded. I have seen no official account of the loss on either side but feel certain from what I saw of the battlefield that the enemy’s loss far exceeded ours. I escaped without a single scratch. The balls seemed to hit all around me as thick as hail, but fortunately they missed me. Please get a pair of my old bootlegs at home and have Parks to foot them for me, for I will need boots this winter if we stay in this part of the country. Tell him to make them ? size smaller than the last pr of shoes he made for me last June or July. Please send them to me as soon as he can fix them or by the first person coming up this way. We have had two or three pretty heavy frosts during the last week and teh nights are quite cool, but it is still right warm in the middle of the day. 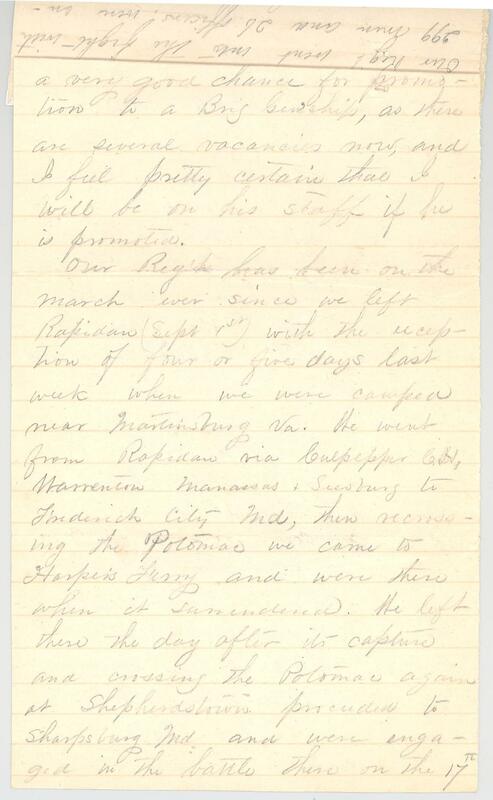 This entry was posted in Southern Historical Collection and tagged 27th Regiment North Carolina Troops, Battle of Antietam, Battle of Sharpsburg, Harper's Ferry, James A. Graham, military promotion, Orange County, Orange Guards, William A. Graham. Bookmark the permalink.